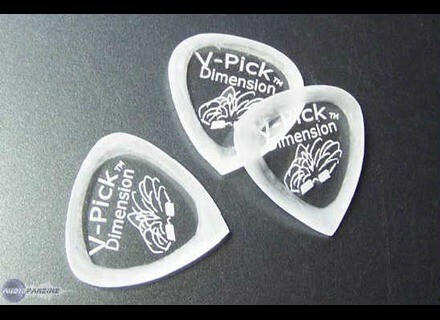 Dimension, Guitar Pick/Plectrum from V-Picks. 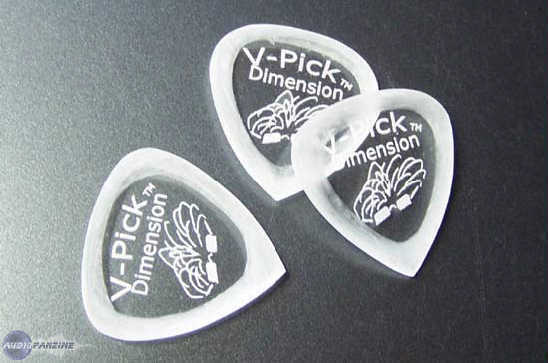 Designed in honor and in celebration of Michael "Muddy" Lawrence, V-Picks have released their new Dimension Guitar Pick. This model is cut from the same measurements as a Snake pick, and is 4.10mm thick. This is the first "Hybrid" style V-Pick to be put into production. 2 rounded corners and 1 pointed corner. The pointed end is sharp and plays much like the Screamer. Also, as requested by Micheal, this pick is left unbuffed. So, you get the rough, mat finish all the way around the edge. According to Lawrence, "this creates a very unique tone and effect. In the 80's I used to play some of my V-Picks unbuffed like this to get the effect of Brian May and Billy Gibbons. They both play with coins, as you know. They do this to create an effect that is much like a human voice. Rather than just hear the note or tone, you also hear the movement of the pick. It is like hearing consonants and vowels when a person talks." The Dimension is also available in a buffed version. Same as the regular Dimension, only this pick is flame polished and then hand buffed as well. It has the same feel but it does not have the "whoosh" sound as it's sibling does. Check out www.v-picks.com for more info. Manne Raven Gloss Manne has introduced its new Raven Gloss model. Vibramate V5 Model Quick Mount Kit The Vibramate V5 Model Quick Mount Kit is designed for installing a Bigsby B5 "Original" Vibrato on most traditional style guitars that have a Tune-a-Matic type bridge and a Stop-Tailpiece. Manne Redwing Satin Special Manne has introduced its new Redwing Satin Special model.